Our City is a great place for businesses and families. Our goal is to make things even better. The following illustrates the opportunity for a better City with more careful and responsible use of taxpayer dollars. Our City needs to be more responsible with taxpayer dollars. We should be able to expect our City to hold itself to similar standards of financial stewardship and responsibility as expected of taxpayer businesses and households. From 2003 to 2014, the population of Red Deer increased from 72,691 to about 98,585, an increase of 35.62%. During this same period, Alberta’s inflation rate increased 26.63%. 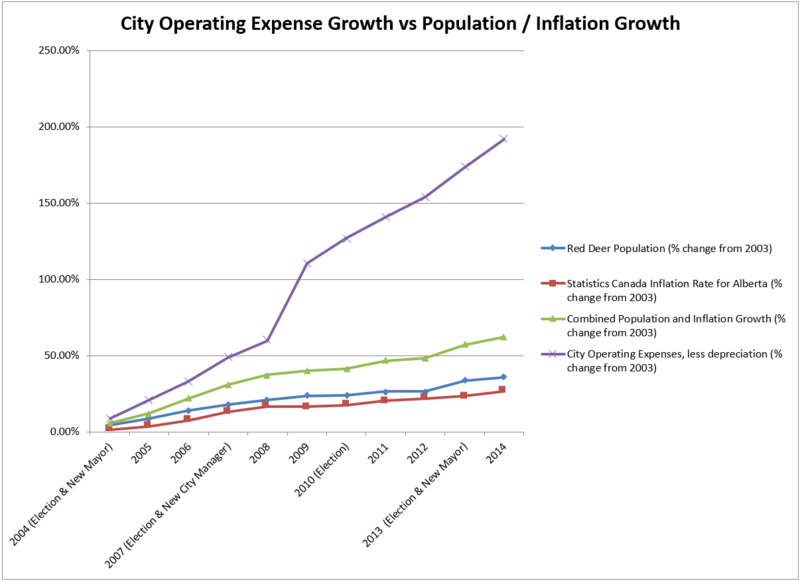 Therefore, combined growth in Red Deer’s inflation and population for 2003 to 2014 was about 62%. Compare this 62% increase with exponential increases in our City’s operational expenses (less depreciation) for 2003 to 2014, about $90 million in 2003 exploding to over $262 million in 2014, an increase of about 191%! The area in red of more than $598 million amount partially or wholly represents inefficient use or waste of taxpayer dollars by failure to keep spending increases in line with inflation and population increases. In 2014 alone, this potential inefficient use or waste of taxpayer dollars is more than $116 million. When our City strives for excellence in its responsible use of taxpayer dollars, it makes it easier for individuals, families and businesses in our community to do likewise.